Beyond providing data for all 32 NFL teams, PFF also supports network broadcasters with game-preview packets that are used to enhance the in-game experience for fans and viewers. This Saints-Ravens preview features the same information our broadcast partners use for team research and in-game production. Joe Flacco has attempted deep passes (20+ yards downfield) on 14% of attempts this season, his highest rate since 2013. 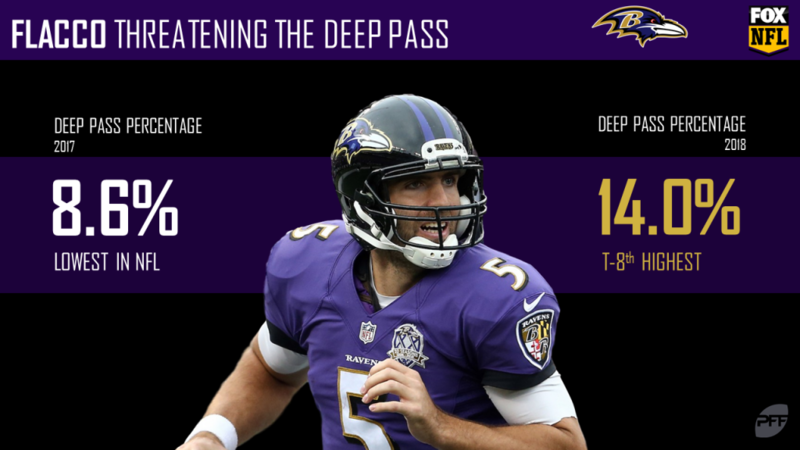 However, despite the higher rate of attempts, Flacco’s passer rating on those deep passes is only 70.8, which ranks 27th among quarterbacks this season. 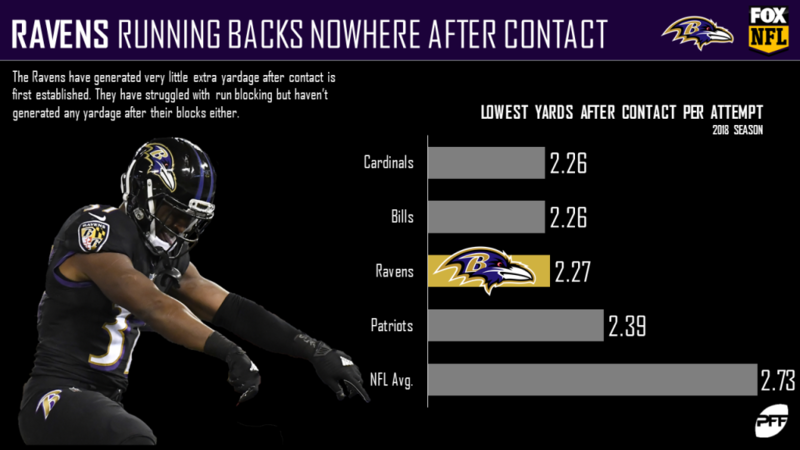 The Ravens running backs have had trouble creating yards after contact this season. Their 2.27 yards after contact as a group ranks as the 3rd-lowest in the NFL, below the league average of 2.73. The Ravens defense has pressured the quarterback more than any other team in the league. 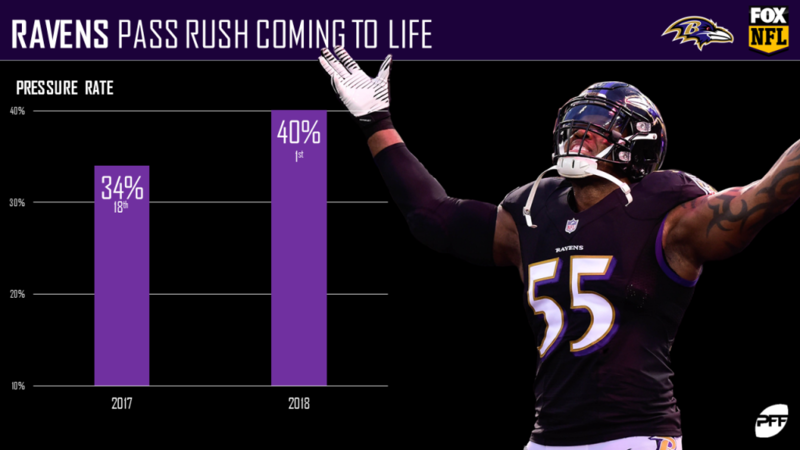 Za’Darius Smith and Terrell Suggs lead the way with at least 20 pressures each. 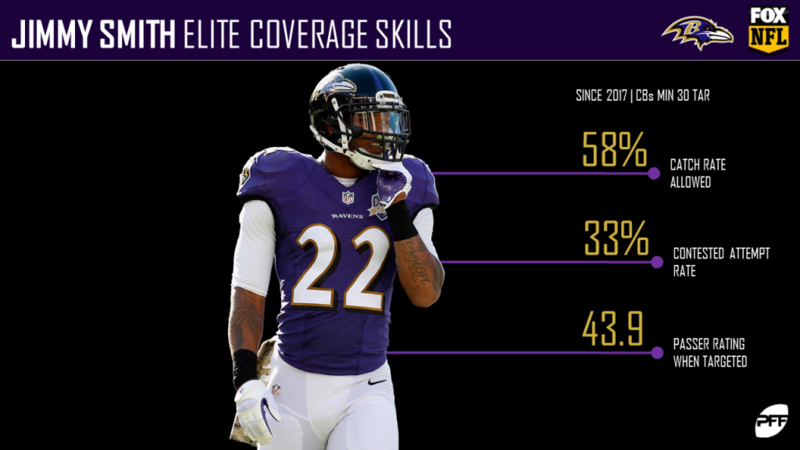 Jimmy Smith has long been among the best cornerbacks in the league. Since 2017, he has allowed a catch rate of only 58% and a passer rating of just 43.9. 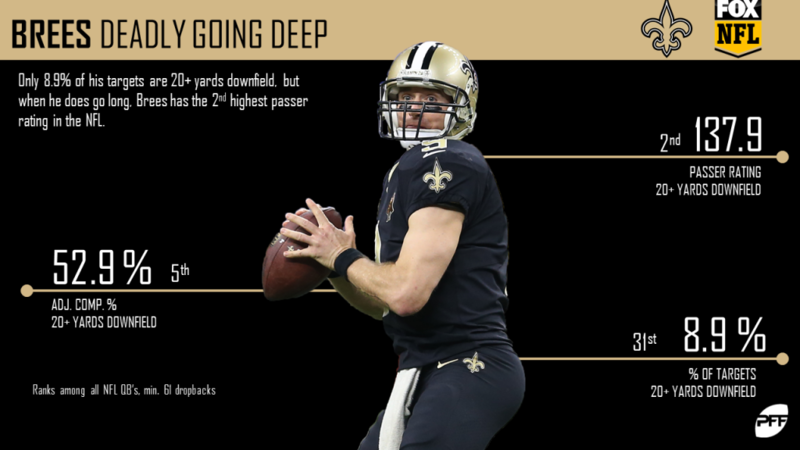 Just as Drew Brees showed with the 62-yard touchdown pass to Tre’Quan Smith that broke the record for most career passing yards, the Saints’ quarterback has been lethal passing deep (20-plus yards downfield) this season. Through six weeks, his 137.9 passer rating on deep passes is second-highest in the NFL. After a sensational rookie season in all facets, Alvin Kamara‘s rushing grade has dropped from his 2017 mark of 86.1 to 63.2 this season. 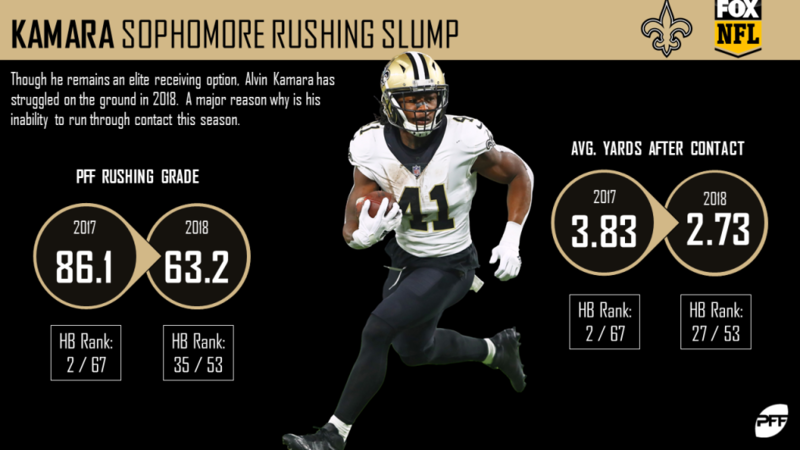 Kamara will look to improve that grade this Sunday. 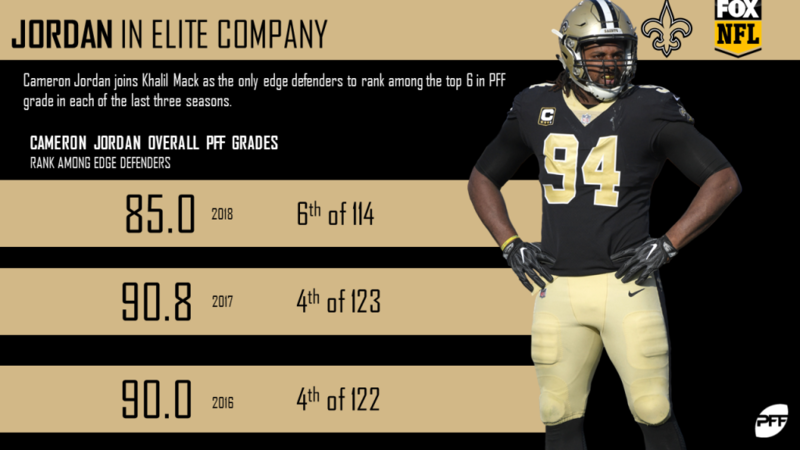 Cameron Jordan is yet again one of PFF’s highest graded edge defenders. He joins Khalil Mack as the only edge defenders to rank in the top six in overall grade in each of the last three seasons. 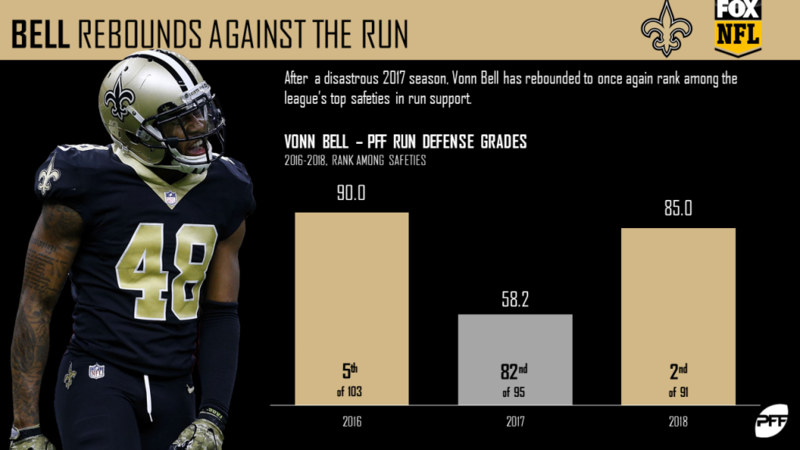 The Saints have earned the seventh-highest run defense grade (82.5) among teams this season, and Vonn Bell is a big reason why. Through six weeks, Bell’s run defense grade of 85.0 is good for second among all safeties. PFF Greenline has projections for the spread, moneyline and over/under of the Saints’ matchup with the Ravens. Get its picks here.